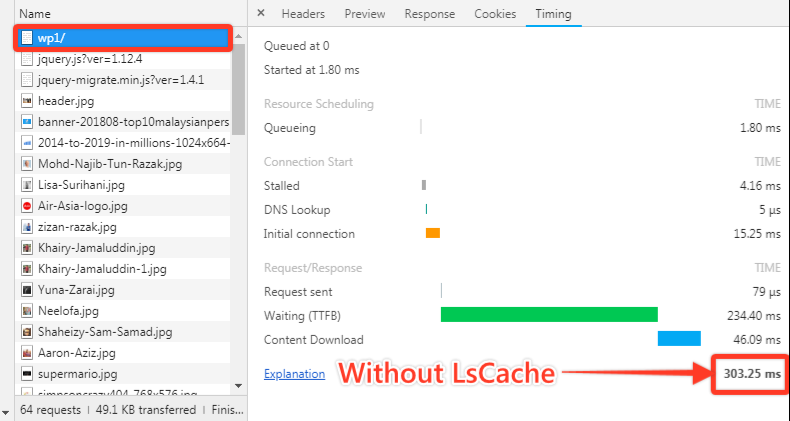 How Much of a Difference Does Litespeed Cache Really Make? The 3 performance charts below demonstrate the page loading speed difference between 3 different WordPress websites. WP1 is a non-Litespeed Cache plugin WordPress website, WP2 is a Litespeed Cache plugin enabled WordPress website and WP3 is a WordPress site using the W3 Total Cache WordPress plugin. By using Google Chrome DevTools Network panel to analyze each individual page loading time, we can see that WP1 scored 303.25ms, WP2 recorded 47.30ms while WP3 recorded a loading time of 64.61ms. 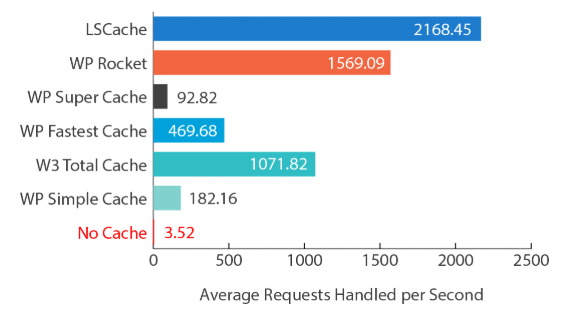 Based on this results, we can tell that WP2 which has the Litespeed Cache (LsCache) plugin enabled, performed far more superior than WP1 with a massive 541.12% decrease in page load time when loading the home page . 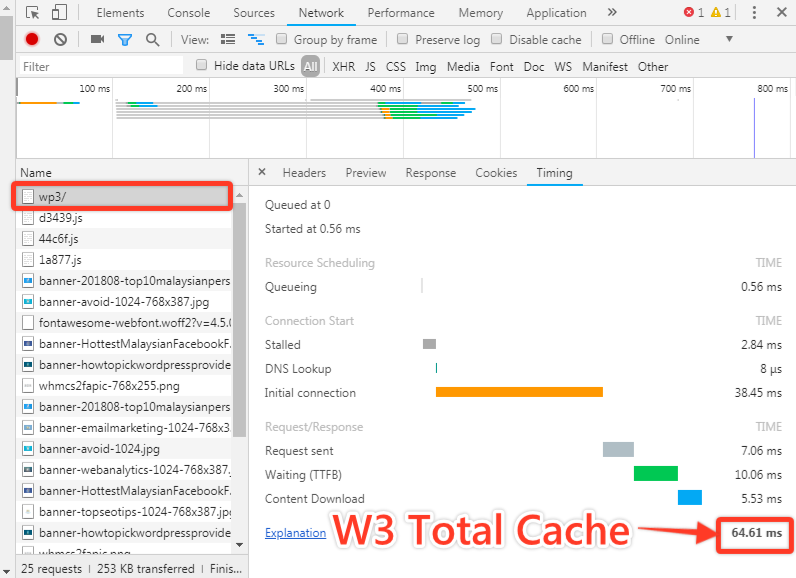 When comparing W2 with WP3 (using cache plugin W3 Total Cache), we observed a creditable page load time reduction of 36.59% when loading the home page. 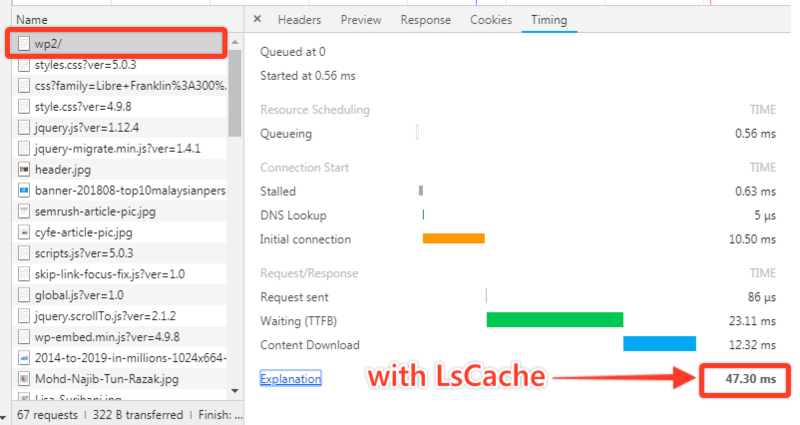 This shows that websites utilizing the Litespeed Cache plugin able to produce fantastic page loading performance than non-Litespeed Cache enabled websites. So What Benefits You Will Get From Reduced Page Loading Speed? And all we did was enable a Litespeed Cache plugin provided by ServerFreak, taking less than 2 minutes to install and costing us absolutely nothing! What Do Website Performance Websites Think of LiteSpeed Cache? Note that there are more performance gains to be had for these test sites, we did not optimize them or squeeze everything we could out of Litespeed Cache plugin. The idea was to showcase the bare minimum to highlight the sort of results you can expect simply by installing the Litespeed Cache plugin. When we activated the Litespeed Cache plugin, we observed that page loading speed has been reduced by nearly 50% on WP2 ! 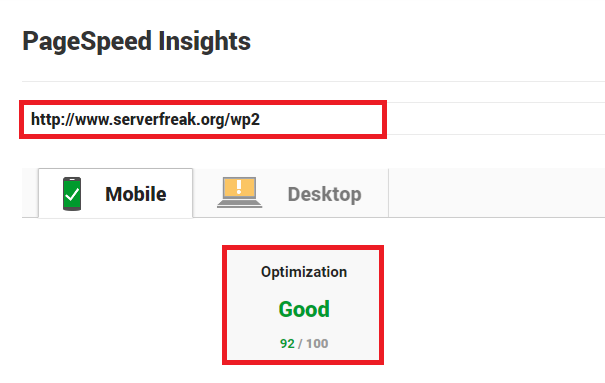 Based on the results provided PageSpeed Insights by Google, WP2 recorded the highest performance optimization score of 92/100 followed by WP3 at 87/100 and lastly by WP1 with the score of 75/100. This results prove that cache plugin such as LiteSpeed Cache helps to deliver fast web experience to the end user and achieve superior performance boost than other WordPress cache plugins! 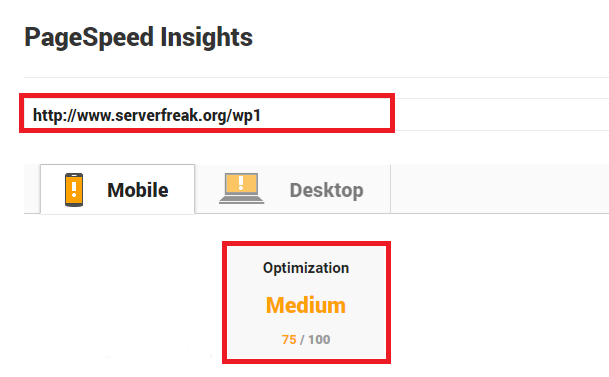 Based on the Pingdom Tool Load Time results, it can be seen that WP2 with Litespeed Cache plugin enabled scored the fastest loading speed at 11.70 seconds, which is 44% much faster than WP1 (20.92s) and 40.24% faster than WP3 (19.58s) which have the W3 Total Cache plugin enabled. Our personal experimentation above was performed using a website with zero traffic… On a website with a large number of visitors, you should expect an exponentially larger boost in performance due to the fact that Litespeed Cache (LSCache) reduces the likelihood of a bottleneck forming due excessive resource usage or being throttled by cPanel. 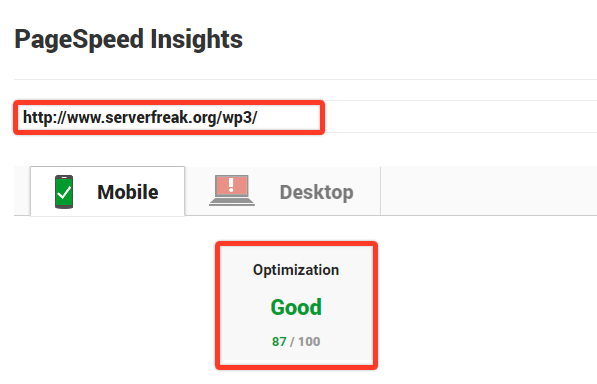 In similar tests performed by LiteSpeed, it was found that a standard WordPress website that was experiencing extreme load would deliver an average of 3.52 pages per second (assuming no other caching plugins are being used). With LiteSpeed Cache enabled, these same websites were able to deliver a whopping 2,168 pages per second! It’s a no-brainer, really. LiteSpeed Cache is easy to install using WordPress, costs you nothing, and drastically improves the performance of your website so if you’re not already using it, what are you waiting for? Get started today with ServerFreak&apos;s LiteSpeed server !